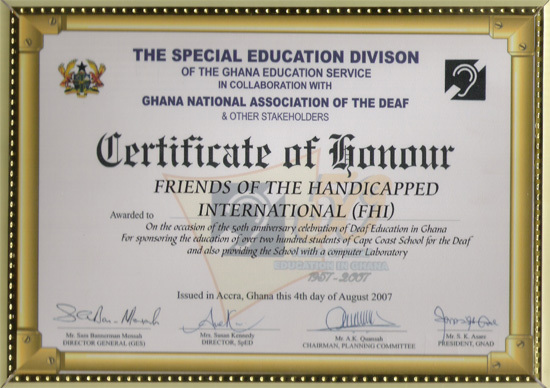 FHI dedicates this Certificate of Honour to our God, the Father of our Lord Jesus Christ for given us the grace to serve the vulnerable, deprived and neglected needy children with disabilities in Ghana and other African countries and beyond. We especially thank all of you who are solidly behind us and supporting us � in cash or kind, that had enabled us to reach thus far. It is our fervent prayer that, while you continue to partner with us, the glory of our God will be your reward so that, together, we can make great difference in the lives of the disabled, at wherever the Lord God Almighty will send us.